WP Rocket Review: Would you buy a WordPress cache plugin? Some time ago, I got a copy of WP Rocket from the guys that developed it in order to test it and write a review about it. I was curios what this paid WordPress cache plugin has to offer in comparison with other free plugins out there, some of them very popular and used by lots of developers. For valuable work on development of sites you’ll need a good comfortable editor necessarily. There are lots of requiring paid products for this specific purpose, but I’d like to showcase a free of charge simple to use editor – Codelobster PHP Edition. A dynamic website that provides exactly what is needed to achieve high traffic and exposure for products desired by professional web designers and developers is MightyDeals.com. Intended to be a cutting edge technical portal to millions of online shoppers, which offers an incredible amount of resources that are necessary to promote and expose such products. With high traffic, leading to vast amounts of sales this website has sellers raving! Being an extremely easy to navigate website, its creators have wonderfully implemented the use of large fonts and brightly colored icons throughout the entire site. This is a real treat compared to other sites that sell software and tools that are time consuming and cluttered. It’s a simple layout with 3 major departments that offer a superior selection of discounted, high end web site developing, and designing products. These are; Featured Deal, All Deals, and Free Stuff. It’s simple as that: a great place for programmers to check out. 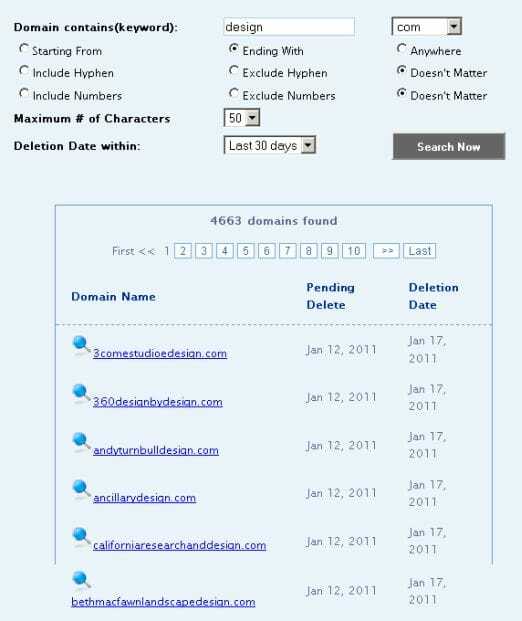 Alex Tsodikov sent me a copy of his Cachelogic Expired Domains web application for a quick review. This is a script that lets you run your own expired and Deleted Domains website. Thousands of domains expire and get deleted daily. This application updates the database with the latest expiring domains either ending in .com, .net, .org, .info, .biz, .us, .ca or .mobi. The script is unencrypted and customizable to fit your needs. Its installation should not take more than 5 minutes including the upload and the configuration process. The current links are affiliate links to GoDaddy which can be changed so that you can earn revenue for each registration that is made through your own affiliate link. I did lots of tests and the script performs well on all types of searches. It retrieves accurate data, this being one of the things I like about this product. If you are an entrepreneur seeking to buy lots of domains for his business and needs to be updated each time when particular domains are about to expire and available for purchase, then I’d recommend this script. Although it does its job, I believe the $80 price for a single domain license is quite steep. Therefore, I’ve asked Alex to offer a discount for BitRepository.com readers. He agreed and created an exclusive coupon BITREP that would save you $20 off the regular price. Jeff Star, founder and lead developer of Monzilla Media, has sent me a copy of Digging into WordPress v2 for review. He has written this book with co-author and master designer Chris Coyer of CSS-Tricks. The eleven chapter book, packed with 400+ pages of WordPress tutorials, techniques, tips and tricks was released after a year of production, design, planning and writing. WordPress is currently the most popular publishing platform. It focuses on aesthetics, web standard and usability. It’s famous for its 5-minutes installation and comes with a complete user-contributed documentation. This is one of the reasons I like working with WordPress. Starting as just a blogging system, it has evolved to be used as full content management system and so much more to the thousands of plugins, widgets and themes, WordPress is limited only by your imagination (and tech chops).